After hours of run and gun fishing the drag on our 30 class stand up rod was screaming like a jet engine. I knew we had hooked up a yellowfin tuna. 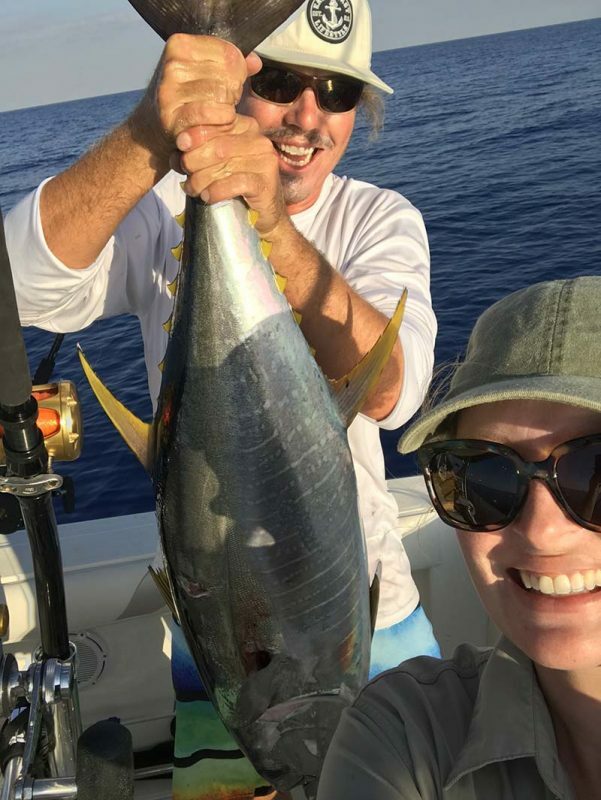 For my wife Jessi, this was her first trip to specifically target yellowfin tuna. We had been waiting a long time for a good weather window to fall on her two consecutive days off from work. We cleared the St. Lucie Inlet on our 27 Whaler Outrage dubbed “The Freaky Sabiki” around 9:00 a.m. headed for The Bahamas. After getting out to the stream, the seas picked up to a mid-period, three-to-four foot swell with the occasional six-foot-plus. We decided to push forward, as we could still run at a reasonable pace and we made it to the customs office in West End around 12:30 a.m.
After clearing customs, we chunked up a flat of sardines, filling a five-gallon bucket. We were now ready to tune the radar for birds and begin the hunt. Once we rounded the corner towards the northwest Providence Channel, seas flattened out to a glassy one-to-two-foot long period swell. We scoured for two hours chasing every promising blip on the radar. Sadly, Mylar balloons were dominating the radar screen and we picked up enough of them to have a small parade. After running in zig-zags for over 40 miles, we found some very promising birds with large tuna breaking the surface. We fished several flocks of birds for over two hours, both chunking and trolling, but had no success. Our mood had diminished as we could see the tuna but could not get them to bite. The sun was getting low at this point and Jessi had passed out on the beanbag chair while I continued to try and find a more cooperative school of tuna. I homed in on a large flock of birds that were flying high. Knowing the tuna were deep, I set up for a long drift way in front of them to see if I could entice them to the surface with a trail of chunk baits. “Fish on!”, I yelled and Jessi woke in confusion as I reeled in a cow mahi. We had our ice breaker and I had a feeling we were about to find our prize. Moments later yellowfin tunas were chasing thousands of flying fish off of our starboard side, merely 50 yards away. We maneuvered the boat in front of the flying fish and started unloading our five-gallon bucket. Moments later the drag was screaming and we were at half a spool on a 30 class reel; we knew it was a yellowfin. Fighting the urge to increase the drag, we questioned if we were going to get spooled. Seconds later, the next rod started going and both lines were singing. Now we were having fun and wondering how we were going to do this with just the two of us. Approximately 15 minutes later the first yellowfin tuna was pin wheeling under the boat. At this point, the second fish still had not budged and was at least 350 yards under the boat. We continued to let that fish run so we could team up and get the confirmed yellowfin tuna on the boat. Boom! 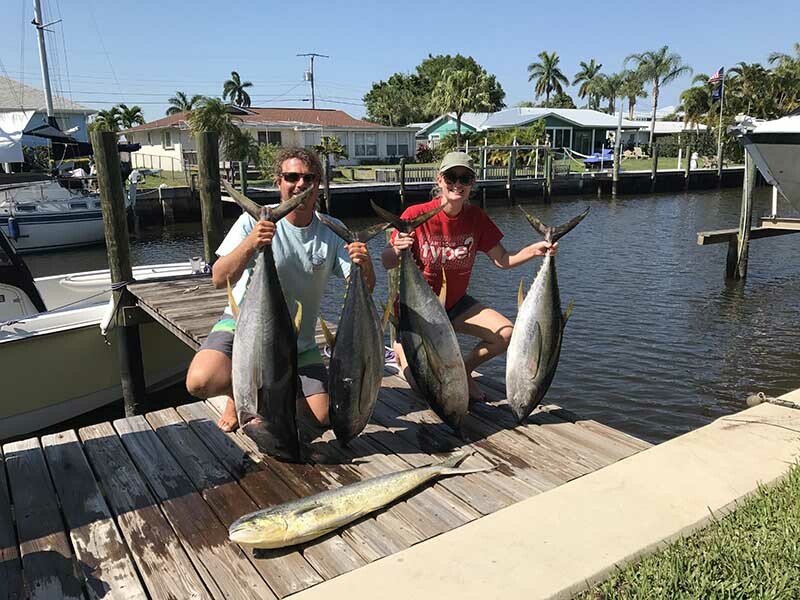 Yellowfin gold hit the deck. We were ecstatic and did not even notice or care that the other fish had broken off. We regrouped and maneuvered the boat back in front of the birds. Less than five minutes later we had two rods screaming again and we were both hooked up to some quality size fish. As two more yellowfin tuna hit the deck, the next rod started screaming with our largest fish yet. This one was a runner and had attracted a large shark who was swimming around the boat waiting for his hand-delivered meal. The tuna saw the shark and did a high speed circle around the boat entangling in the props. Somehow I was able to reach down and untangle it, all the while the tuna was getting chased by the shark. Jessi gaffed the yellowfin with the shark in full attack mode just feet from our prize. We were ecstatic and could not believe we landed it against those odds. 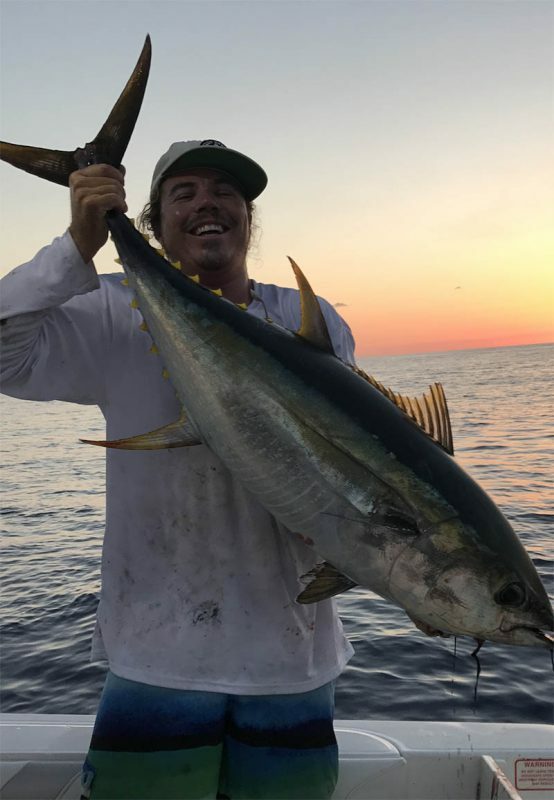 We discussed going for another, as the tuna were all around the boat, however, we decided the sun was almost set, we were wiped out, and had more than enough meat. We left the tuna biting and headed for West End to anchor up and camp on the deck. The following morning, after some snapper fishing and free diving, we headed home at wide open throttle. 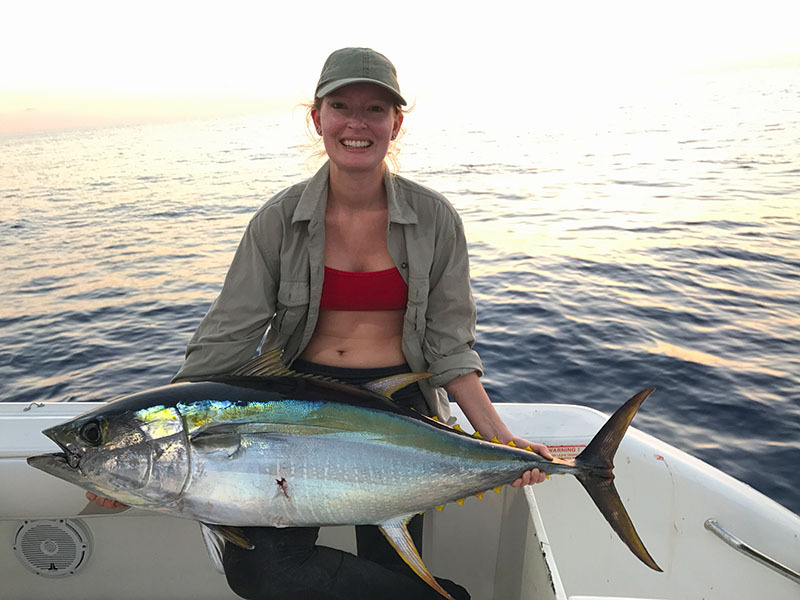 It was such an amazing experience to have just the two of us catching world class fish, especially since this was Jessi’s first yellowfin tuna. She is definitely addicted now! Team work in The Bahamas. Jeremy Lund with a Bahamas yellowfin.